The retiring President/CEO of Conner Prairie Interactive History Park had a long and extraordinary tenure, developing the site into one of the most innovative history venues and most visited indoor/outdoor museums in the U.S. with 387,000 annual guests. It is situated on 850 acres of former prairie land where five outdoor and two indoor exhibits are offered. 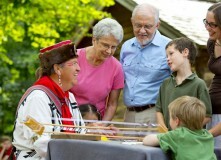 With major support from the National Science Foundation, the institute of Museum and Library Services and Duke Energy, Conner Prairie expands its breadth of learning opportunities through innovative integration of living history with STEM (science, technology, engineering and math) activities. The new President/CEO would be an unusually dynamic and visionary leader who could build on what had already been accomplished and take Conner Prairie to its next level. He or she would be dedicated to experiential learning in addition to having the traditional CEO skills: fundraising, budgetary and organizational. The ideal candidate had to be strategic, collaborative, passionate about the organization’s mission and have excellent external relations skills, political savvy and the ability to engender trust and respect among staff, trustees and the community. A Masters in History was highly preferred, but this Search Committee was eager to look at stellar “out of the box” candidates from the private sector as well. Our search strategy included several actions performed simultaneously for this savvy, fast-paced and well-tuned Search Committee. We searched our database for people with the position’s requirements, placed advertisements on appropriate websites, and developed a list of people we targeted to actively pursue. Enthusiastic recommendations of potential candidates in a wide variety of disciplines, public and private, came from our own contacts and from devoted supporters of Conner Prairie. These efforts yielded a large number of qualified candidates. Equally if not more important was the best “fit” with Conner Prairie’s culture, board, staff and community. The panel of finalists considered by the Search Committee came from the history field, from path‑breaking education organizations and one from a prominent position in the corporate world. The finalist, Norman Burns, came from Maymont Foundation, a public/private multi‑disciplinary museum situated on City park land in Richmond, VA. Under Norman’s leadership Maymont had undergone an enormous revitalization in outreach, programming and enhancement of the site, including the successful launch of a $35 million capital and endowment campaign. Norman’s professional experience and personal demeanor was the ideal fit with Conner Prairie. Norman arrived in January, 2016, to begin his new position.